Founded in 1929 and headquartered in Naperville, Illinois, Wilton Brands LLC. (Wilton Brands) is a global leader in the production of food-crafting goods. For over 85 years, Wilton has provided unique, creative baking and sweet treat products to its customers, including cake decorating accessories, candy and cookie making ingredients, kitchen tools and party and seasonal specialties. The company’s trusted brands include Candy Melts® Candy, Color Right™ Performance Color System and Perfect Results® Mega Bakeware. In the Fall of 2016, Wilton Brands made the decision to move its corporate headquarters from a campus of office buildings to one large facility in an effort to accommodate growing business needs. While the new, centralized office location would facilitate easier collaboration between teams and departments, the move posed several issues in the transition of Wilton’s paper business records. Although the company’s accounting, customer service, human resources and credit departments housed physical invoices and records in a system of filing cabinets, the new office layout lacked the open storage space required for paper-based document management. Wilton made the decision to convert these files to electronic documents and initiate a full transition to a digitized filing system for ease of use and efficient workflow in the future. On a tight deadline with its current lease expiring, Wilton needed a solution to quickly digitize its vast collection of documents while keeping the files accessible for day-to-day business operations. In preparation for a headquarters move, Wilton had over 900,000 paper records stored in file cabinets across multiple departments in need of electronic conversion. The company needed a quick turnaround to digitize all its files before the move. Paper documents could not be sent off site for scanning, as they were required for ongoing business function. Wilton partnered with a third-party firm to examine developing business needs, take an accurate inventory of items to be scanned, and evaluate various providers of document conversion services. The company contracted Quality Associates, Inc. (QAI), a Konica Minolta company and a leader in enterprise-class services and solutions for content and document management, to scan its existing records. Having partnered for years with QAI’s parent company, Konica Minolta, for copier and printer solutions, Wilton felt confident in QAI’s ability to quickly, reliably and securely manage the conversion project. In contrast to other document management companies, QAI stood out for its unique on-site services. Other scanning firms required paper materials to be boxed and shipped out for off-site conversion, posing security concerns for sensitive information and impeding day-to-day business operations by removing necessary files. In April 2017, QAI deployed a dedicated support team to Wilton headquarters and set up an on-site file conversion center. QAI’s team collaborated with Wilton’s internal IT staff and other involved departments to familiarize themselves with project needs and business processes to efficiently complete the project. From April to July, QAI scanned and converted Wilton’s entire database of paper files, while the quality assurance team reviewed each document configuration and ensured files were successfully loaded into the system for future organization and accessibility. QAI’s document scanning and conversion services processed and scanned all paper files on site, ensuring document security and allowing Wilton to continue normal operations. In only three months, QAI scanned over 900,000 documents with 100-percent accuracy and completed Wilton’s conversion project in time for the company’s move in July 2017. 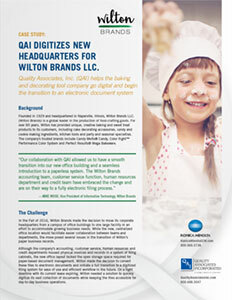 By scanning on site, QAI allowed Wilton to continue normal business operations and retain access to all necessary files. In addition, QAI’s on-site services ensured the safety and privacy of all sensitive documents and secure information. With its volume of paper files scanned and converted to digital format, Wilton has begun its transition to a completely electronic system. QAI’s preparation of the company’s digital files for use in an enterprise content management (ECM) solution streamlined the transition from paper to digital, increasing operational efficiency and transforming business processes. All over 900,000 paper documents were scanned and inspected for quality in just three months, in time for the office move. Wilton is now on the path to a paperless office and completely digital document system, allowing for more efficient storage and effective use of all files. Wilton Brands LLC (“Wilton Brands”) helps consumers in over 100 countries create, decorate and celebrate. Headquartered in Woodridge, Ill., Wilton Brands creates world class inspiration and creative content, effective instruction and education, and innovative products that ensure the consumer’s success. Wilton is the global leader in cake decorating and bakeware products. More information can be found at www.wilton.com. Quality Associates, Inc. (QAI) provides customized solutions and services that turn printed materials and electronic information into useful, organized data that can be readily located and accessed by authorized users. From scanning and imaging to complete, searchable systems that bring information directly to the desktop, QAI offers complete systems integration, support and post-deployment training to ensure success. Founded in 1986 and located in close proximity to both Baltimore and Washington, D.C., QAI has grown significantly over the years into a trusted, experienced Value- Added Reseller (VAR) with an extensive electronic content management (ECM) supplier and partner network. QAI works with federal, state and local agencies; schools, colleges and universities; chemical and manufacturing companies; pharmaceutical, healthcare and medical research organizations; financial, accounting and law firms; professional associations; and many others. For more information, please call (800) 488- 3547.